Although he was only the 43rd overall pick in this year's NBA Draft, all eyes are on Portland Trailblazer Ha Seung-Jin as he attempts to be the first Korean to play in the NBA. Don't let the draft position fool you. His 7'3" / 305 pound frame poses a ton of potential and draws comparisons to Yao Ming. And he will have time to develop, because he just celebrated his 19th birthday. 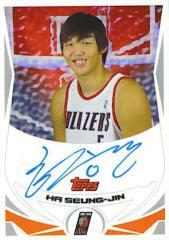 Topps is pleased to announce Seung-Jin's first autographed card in the upcoming 2004-05 Topps Basketball, which hits shelves September 1. This card and 28 others were created on the spot earlier this week at the NBA Rookie Shoot. It was a special moment for the NBA rookies as they got to see and physically hold their first NBA basketball card. All 29 rookies autographed 45 copies of their card and each will be seeded into packs of 04-05 Topps. Each rookie was also given additional cards to give to family members, friends and fans (these cards do not include the 3M authentication sticker). They even enjoyed trading with their future NBA counterparts.